Google India and Reliance Communication has entered a 2 year partnership to offer free 3G data plans from Reliance with all Android phone sold in India. The requirement being that, the phones should be endorsed by Google, i.e all the Androids with a Google logo on the back of the mobile can avail this offer. 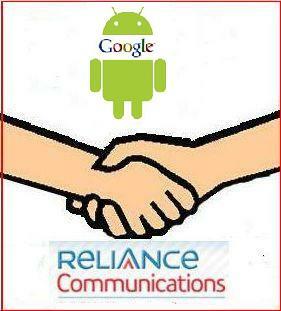 Google and Reliance are expected to spend around 30 crores each to promote this deal. This is another such partnership after the likes of Apple and Airtel, Apple and Aircel, etc. to promote iPhones in India. Google not being the actual manufacturer of the phones, will earn revenues from its Ad and search business by promoting the Android platform. The offer will include a 3G dataplan from Reliance Communication with 1GB free download for first 6 months. One can buy an Android phone from Reliance or any other vendor without subscribing for this data plan. The offer will be rolled out from April 13, 2012. Google has announced that all the Google endorsed Androids sold in India will be given a free 6 months subscription from Reliance Communication with 1GB free download per Month. Interestingly, Reliance Communications official website has not released any news about this partnership. What do you think? Will this partnership help Reliance to get more subscriber? or will Google be successful to increase the Android sales? Leave your comments in the box below.